Available from Datalogic Automation , the UV laser source based on the V-Lase platform features the mechanic optical architecture of Third Harmonic Generation (THG). The UV-Lase wavelength produces less mechanical distortion and less heat affected zones (HAZ) in comparison with longer laser radiations. The high performance of this laser source makes it ideal for the very demanding laser marking and material process applications, such as glass and non-doped plastics in automotive, healthcare, aeronautic, solar and electronics among others. Derived from the long experience in the production of high performance and high quality DPSS laser sources, the UV-Lase laser sources and markers @355nm use the state-of-the-art End Pumped Coupling Technology, which represents the leading-edge solution in the field of laser sources. The V-Lase platform is characterised by a standard compact case, continuous and precise power control and low power consumption. The proprietary end-pumped architecture using a TE cooled diode laser pump with unmatched MTBF ensures the reliability and availability of the system. 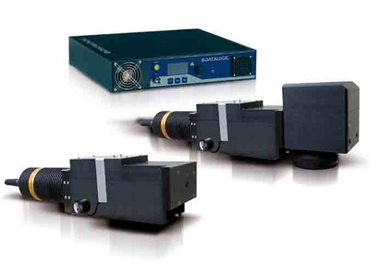 The V-Lase platform offers lasers with excellent beam quality, high peak power and short pulse width. The operator is able to precisely tune the power and pulse repetition rate. Very high brilliance in the laser spot at longer focal lengths makes the V-Lase platform ideal for marking a broad range of materials, even with large marking fields. Designed for very demanding 24/7 processes, the V-Lase platform offers unparalleled performance and represents the ideal solution for both direct part marking and label marking in every market segment including automotive, solar and electronics, packaging, as well as in medical surgical tools marking applications. The V-Lase platform significantly extends the possibility of connection between the laser source and the operating system. The communication with the system is enabled by RS232, and the V-Lase platform also has an I/O for the connection of the TTL and analogue signals. Ethernet connection is available for monitoring.